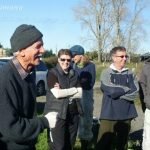 How can a New Zealand beekeeper keep their bees alive every year? 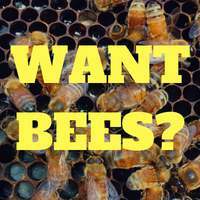 Well this is a good question, over recent times bee-keepers are having trouble keeping bees alive. 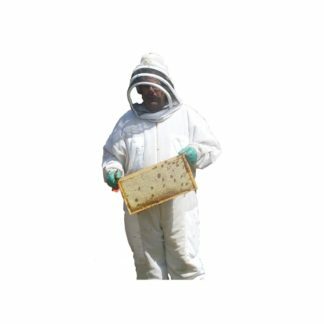 Due to Varroa mites and pesticides in the environment. Last year our plan failed resulting a loss of all our hives. Our plan this year is going to do the following, it's hard to follow a plan unless you have one :). Keep bees elevated at least 12 inches from the ground. To reduce splash up from the Waitakere rains. 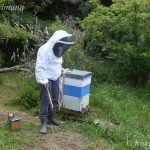 We moved our apiary to a sunnier spot, under tree cover just doesn't work over winter in the Waitakere ranges we have discovered. 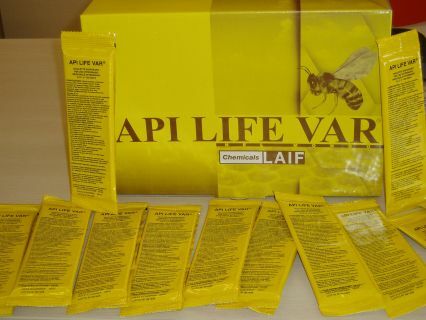 Treat bees with API life Var. An organic treatment that we are trying out this year. Split hives – this disrupts the mites breeding cycle and increases the colonies chance of success. 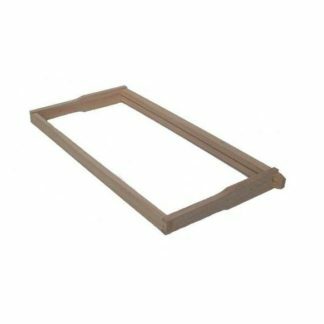 Use drone brood management frames, removing every 24 days (if mites are present in brood). 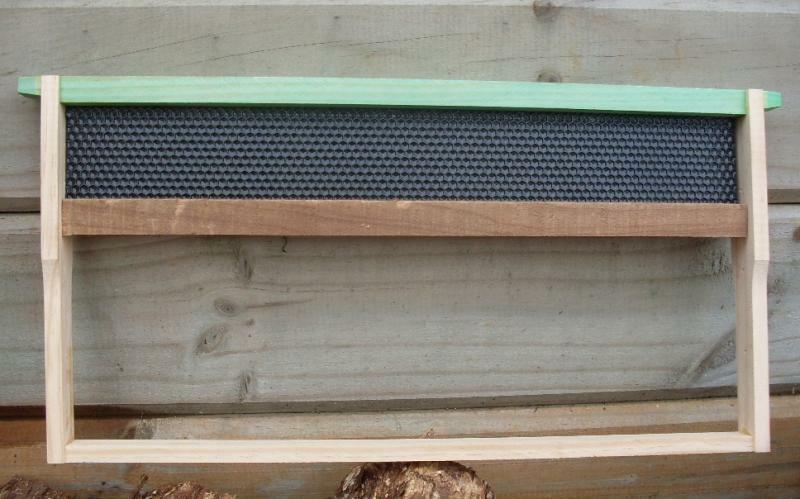 Use screened bottom boards to reduce and monitor mites. Having a Screened bottom can remove up to 25% of the mites, it also allow you to do mite counts. 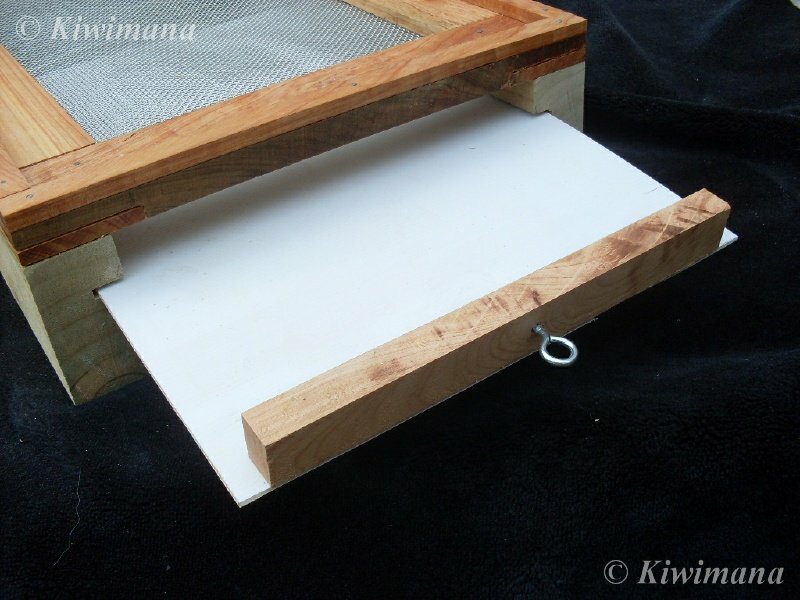 Check for mites at least every month, using a inspection tray in our mesh boards. Use sugar shaking on each inspection (If mites located). 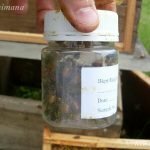 Autumn after honey supers removed – treat hives with Oxalic acid. We have not tried this, so will need to research this further. Have you had any success with Oxalic acid? What are you planning this year?, make a plan and stick it on your wall. Maybe even share your plan here. It would be great to see what others have planned, so we can all learn. 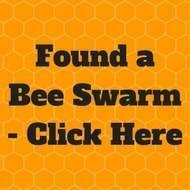 Inspecting Hives and Sending Bees in the post? Next post: Inspecting Hives and Sending Bees in the post? A timely varroa plan. 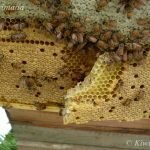 I have noticed a marked increase in varroa on my base boards and have been considering removing all honey and treating my bees now. They had a spring treatment of Thymovar. I thought that an Apistan or Apivar might be appropriate. I also thought about the use of food grade mineral oil. I can’t find my notes on the recipe an was considering equal quantities of mineral oil and honey and wax. What would you do? Yes thats sounds like a good idea to remove the honey and treat, personally we are trying Apilife Var. But yes treat them with what works for your bees. 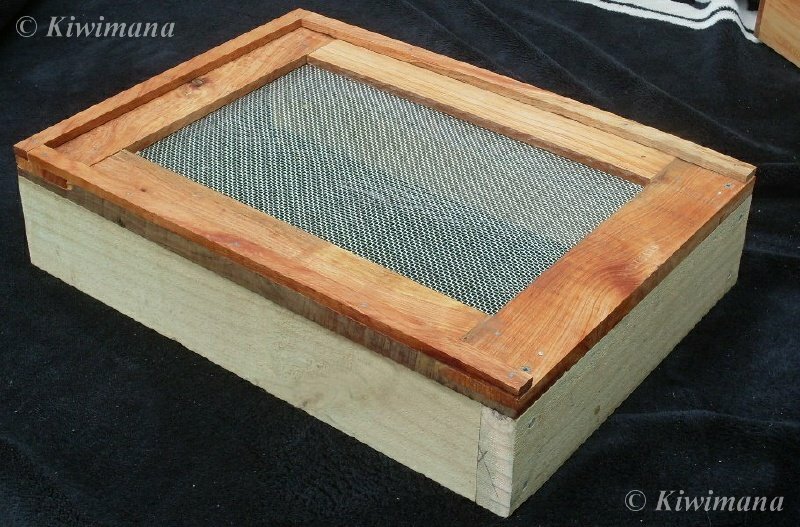 Just make sure that bees still have room to expand when you remove the honey supers. 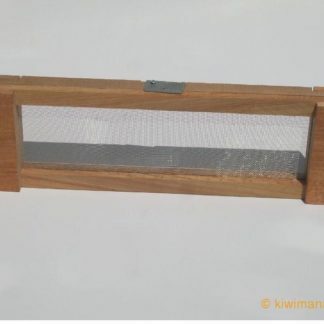 Do you use one or two brood boxes? 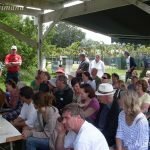 Did you see the presentation from the Anne Hulme at the conference regarding food grade mineral oil and honey, I have the hand out if you are keen to try it. I did oxalic acid a couple of weeks ago. We find it very successful here in England. After treating the monitoring board is often covered in hundreds of mites. Autumn sounds early to do the treatment. Here we do it in midwinter, when there is no or very little brood. This is because the acid does not harm mites in brood cells, so for maximum efficiency you want the mites all on the adult bees. Thanks Emily, yes I need to look into this more. 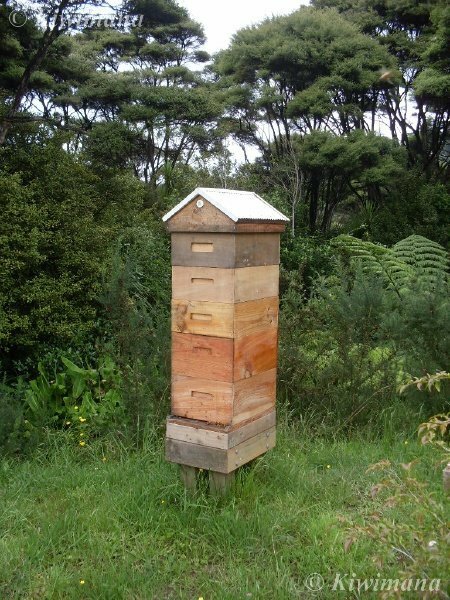 This issue in New Zealand is that we never don’t have brood in a hive. So not sure how effective this will be, will have to see if anyone here has tried it. Just starting out with bees so very interested in your plan. Came across this http://www.beesource.com/forums/showthread.php?222737-reaction-to-api-life-var . which may be relevent. All the best in your endevours. Hi Gary – have you proof of this? Well only from what we have observed in our bee yards, we must try an experiment next season and do mites counts before and after splitting to observe the difference in numbers. we use the oxalic acid as our only treatment for mites. 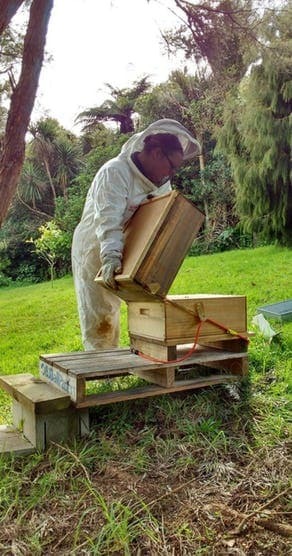 this is an ongoing experiment and this will be the third season for us with some of the hives. What we have found. once a month in winter months bees come out fresh and clean for spring due to smaller brood numbers. spring treatment is every visit for every hive no exceptions. 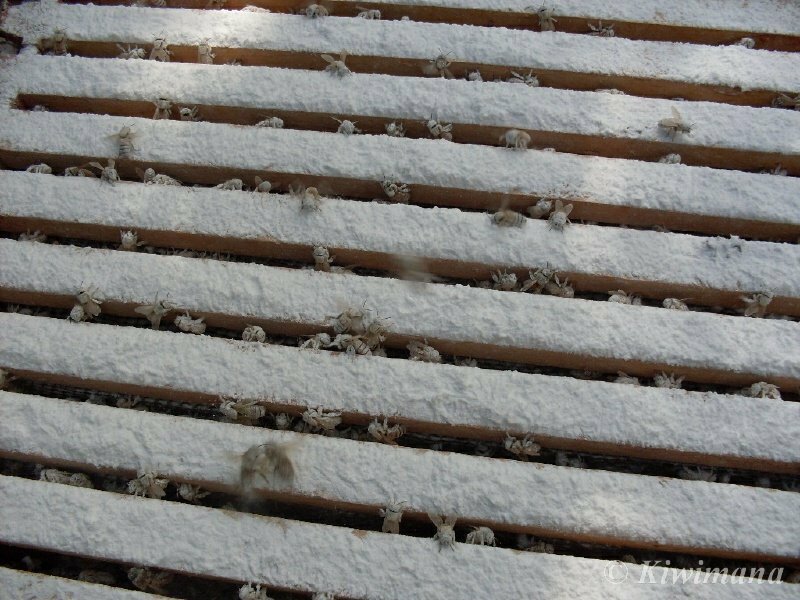 As the oxalic acid only kills varroa on the bees inside the hive. flying bees can just pick up another varroa and the capped brood is a nice safe place for the varroa. As we know varroa can jump in population very quickly so constant treatment is the key. we stop treating during main honey flow and as we take our honey for the year off at the end of dec(all the rest is for the girls and splits) we can start treating if we need to in jan. This honey wont be consumed by humans. We still don’t know if we could treat while supers are on for honey that will be sold as the law states no treatments to be applied while supers are on. I have eaten honey myself as a test with no effects or taste differences. Any info on this would be good-don the fat bee man is pretty adamant its safe to eat. I am curious about the Oxalic treatments you use. How often do you treat, once a week more or less?